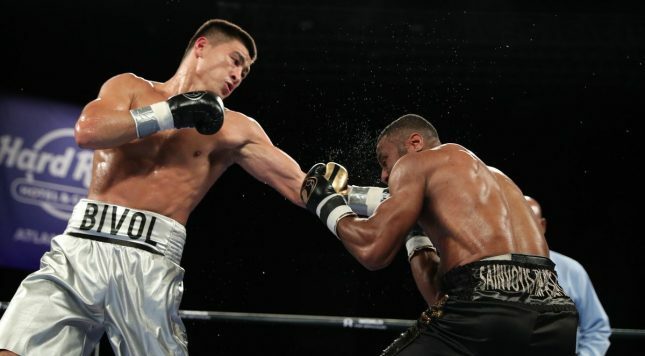 Dmitry Bivol this weekend hoped to make a statement on HBO: That he can be a thrilling knockout artist, not just a winning boxer. Jean Pascal didn’t cooperate, and as such Bivol made no such statement. But, it’s kind of looking like Bivol just isn’t that guy. Sometimes, Bivol has fought too patiently to be very fun, more like a calculator that a force of nature. That’s not how he fought Pascal. He said he’d come out aggressive, cognizant that his last low-contact performance against Isaac Chilemba left a bad taste in fans’ mouths, even if the spoiling, crafty Chilemba is the sort who can stir any fight into arsenic. So Saturday night we had Bivol, perhaps the best talent at light heavyweight, really trying to score the KO, and instead it was another Bivolian scorecard wipeout. You might point to his 11 KOs in 15 fights as evidence of his power, but against his three best opponents — Sullivan Barrera, Chilemba and Pascal, his last three fights in that order — there’s been little evidence of any significant warheads in his gloves, save the last-round TKO against Barrera. But, it’s not as if those other two have gotten knocked out by anyone other than, well, notoriously mean puncher Sergey Kovalev; Chilemba’s only KO loss came due to his retiring with a broken hand. And with just 15 fights to his name, maybe it’s too soon to draw any conclusions about what kind of knockout capacity Bivol has. But there’s cause for worry that if he can’t KO this ilk, perhaps he can’t KO the next level guys, either, the guys he says he wants to fight: Badou Jack and Eleider Alvarez. What we can know at this point is that Bivol is an excellent fighter. He just doesn’t lose rounds, he’s a sharp offensive fighter who doesn’t get hit clean often and even when he does, he seems to have a great chin. A matchup with Jack or Alvarez would be most, most welcome. Now, Pascal at age 36 basically had no chance, to be sure. Even his finest round, the 8th which saw him gun for the knockout, was much more thunder than lightning. At his career best, Pascal relied heavily on a combination of raw athleticism and awkwardness. He still has the latter in bulk — it’s rare to see a fighter throw both a left and right at the same time, but doing it twice in one fight might have happened exactly once in boxing history, i.e., Saturday — but much less of the former. Pascal’s manager suggested to HBO’s Jim Lampley that a win against Bivol might have sealed Pascal’s ticket to the Hall of Fame. Nah. Even a win of that caliber, a win you could argue was the best of Pascal’s career, doesn’t get him to the door. Pascal has had a helluva career, though. The undercard brought us the very odd junior featherweight prospect Murodjon Akhmadaliev, a former bronze Olympic medalist. He’s just five fights in now, so it’s natural that he’s still raw. But it’s strange to see a fighter have such nimble feet and such natural power, only to have the feet at times neutralize the power. At times, Akhmadaliev was shuffling his feet mid-punch, leading to a lot of cuffing shots. Still, he dominated his step-up opponent, Isaac Zarate, and he was all-offense, so it’ll be nice to watch him develop and figure out when to move and when to fight.